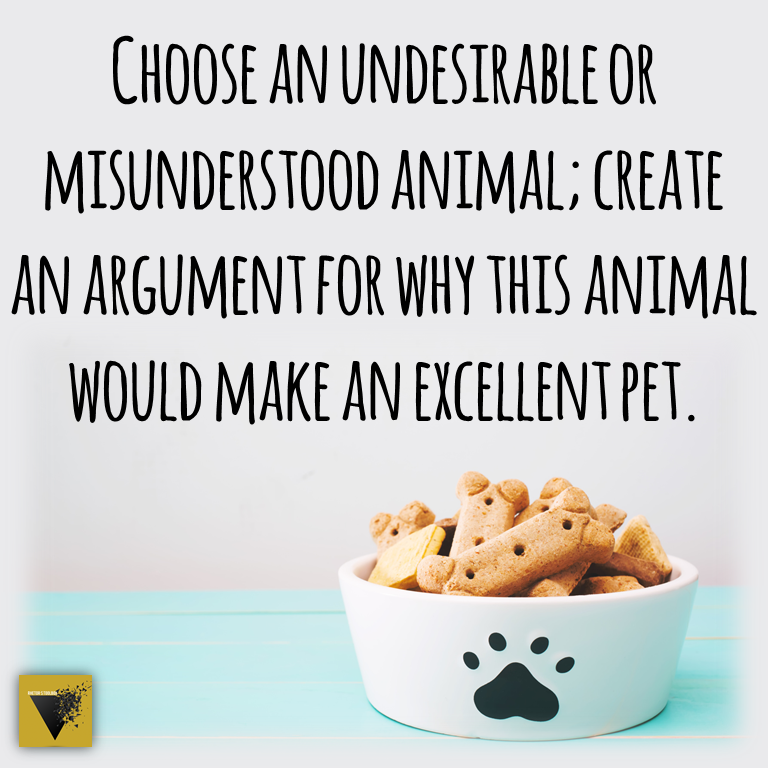 Choose an undesirable or misunderstood animal; create an argument for why this animal would make an excellent pet. 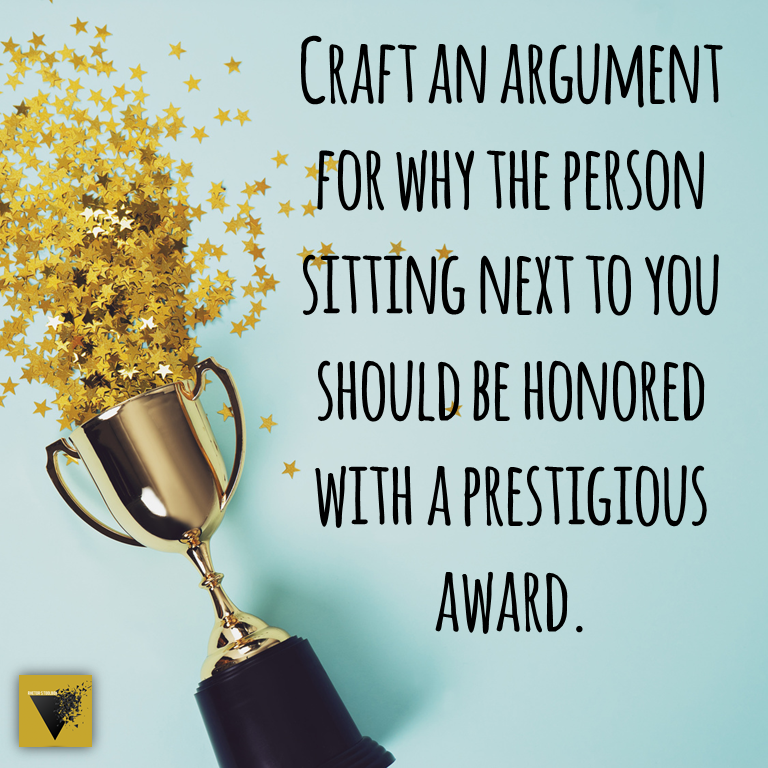 Craft an argument for why the person sitting next to you should be honored with a prestigious award. 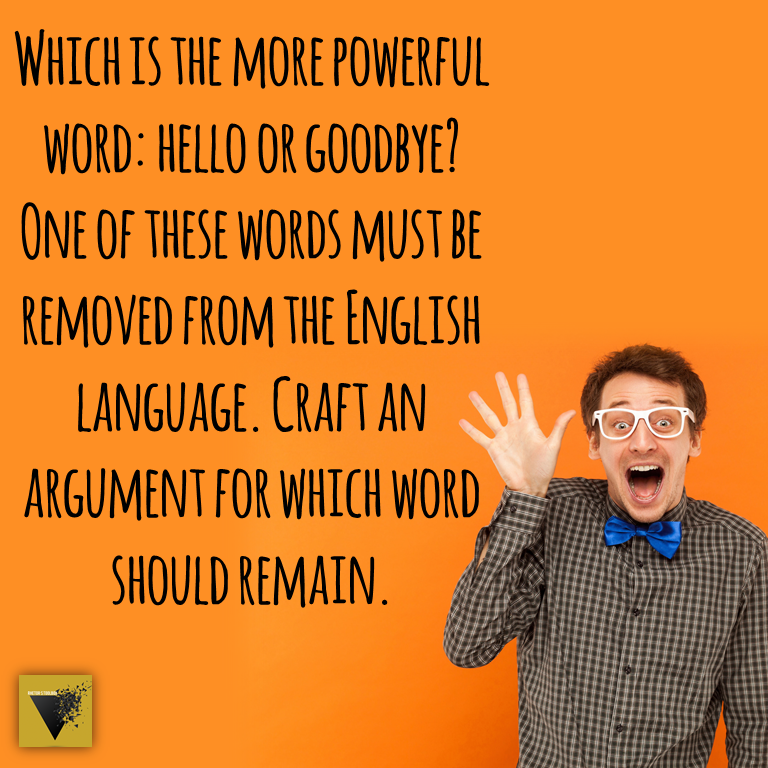 Which is the more powerful word: hello or goodbye? One of these words must be removed from the English language. Craft an argument for which word should remain. 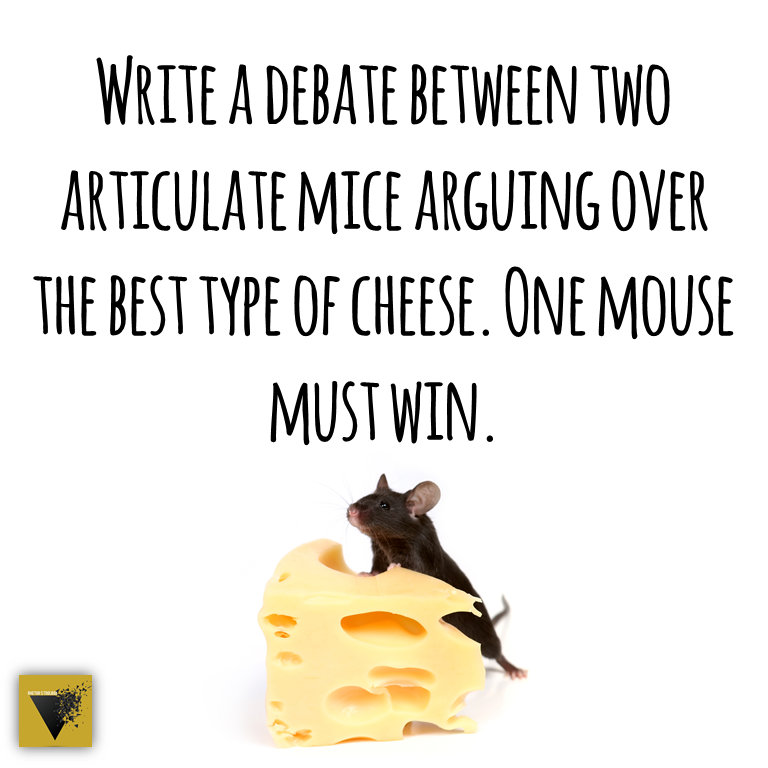 Write a debate between two articulate mice arguing over the best type of cheese. One mouse must win. 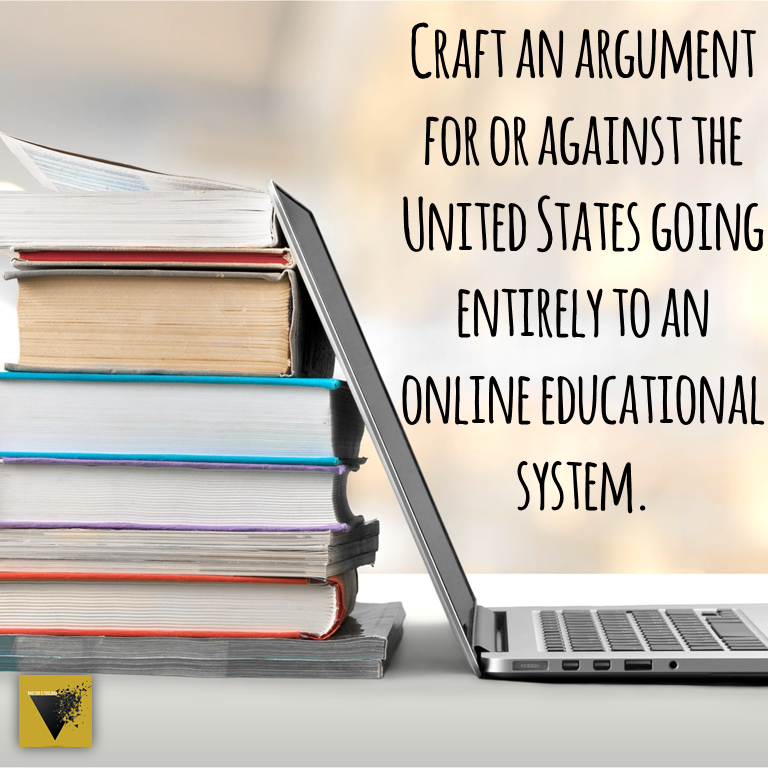 Craft an argument for or against the United States going entirely to an online educational system. 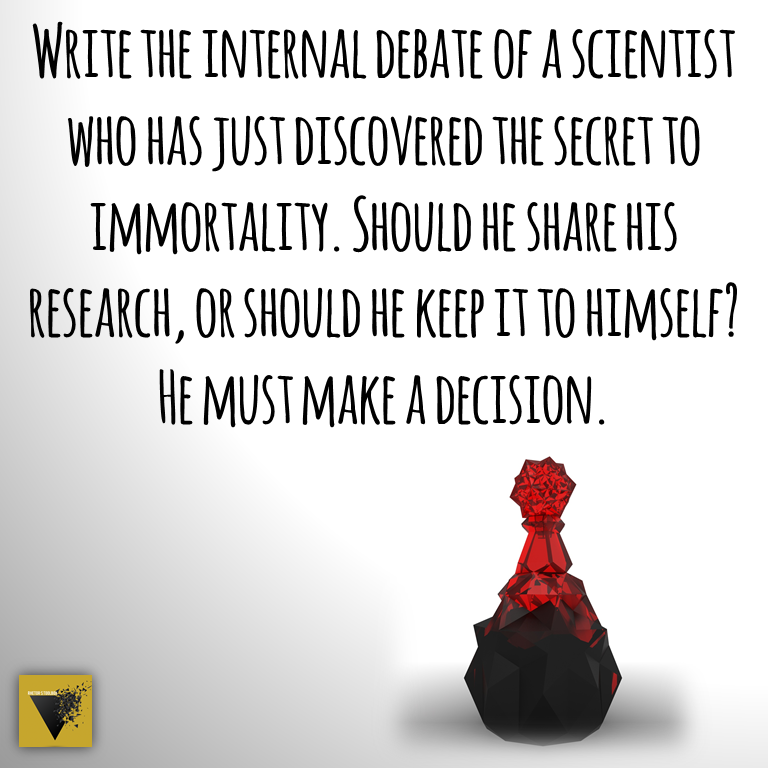 Write the internal debate of a scientist who has just discovered the secret to immortality. Should he share his research, or should he keep it to himself? He must make a decision. Imagine you have the technology to record people’s memories. 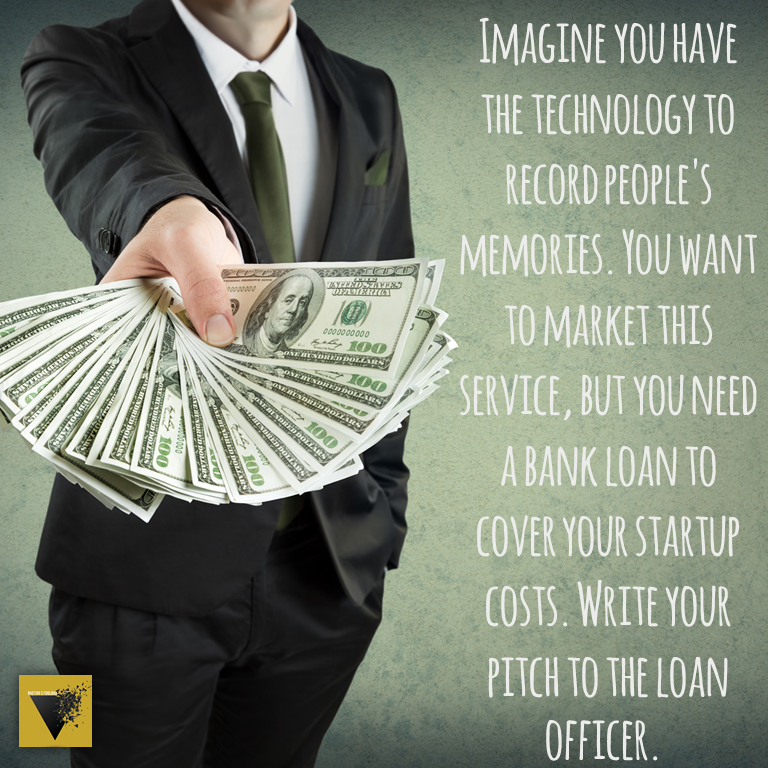 You want to market this service, but you need a bank loan to cover your startup costs. Write your pitch to the loan officer. 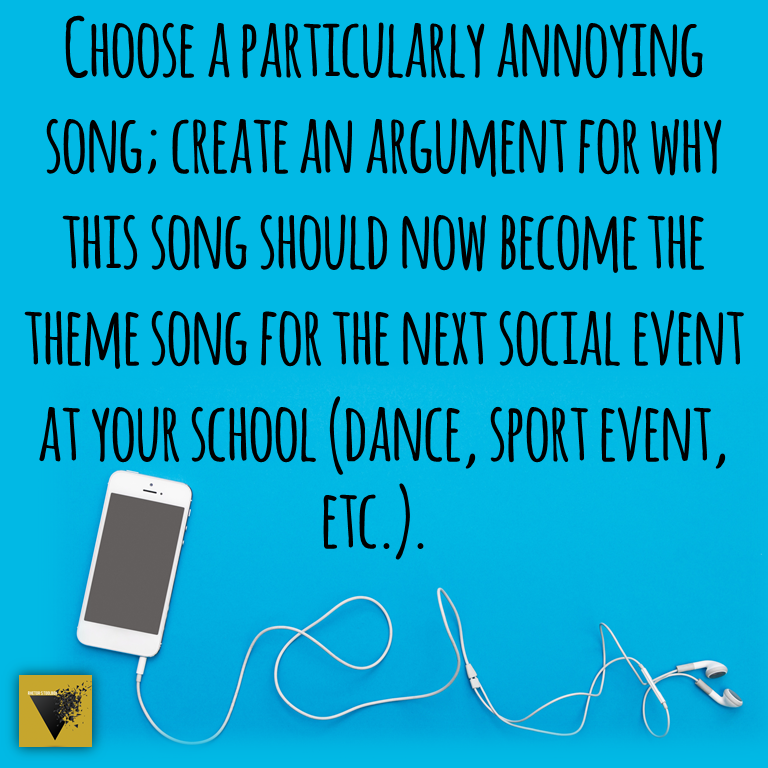 Choose a particularly annoying song; create an argument for why this song should now become the theme song for the next social event at your school (dance, sport event, etc.). 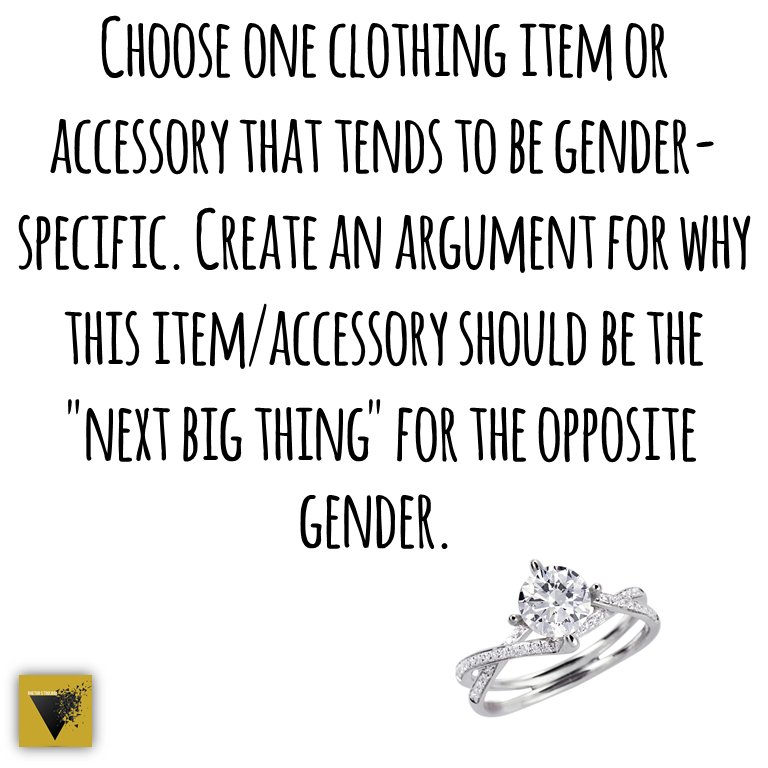 Choose one clothing item or accessory that tends to be gender-specific. Create an argument for why this item/accessory should be the “next big thing” for the opposite gender. 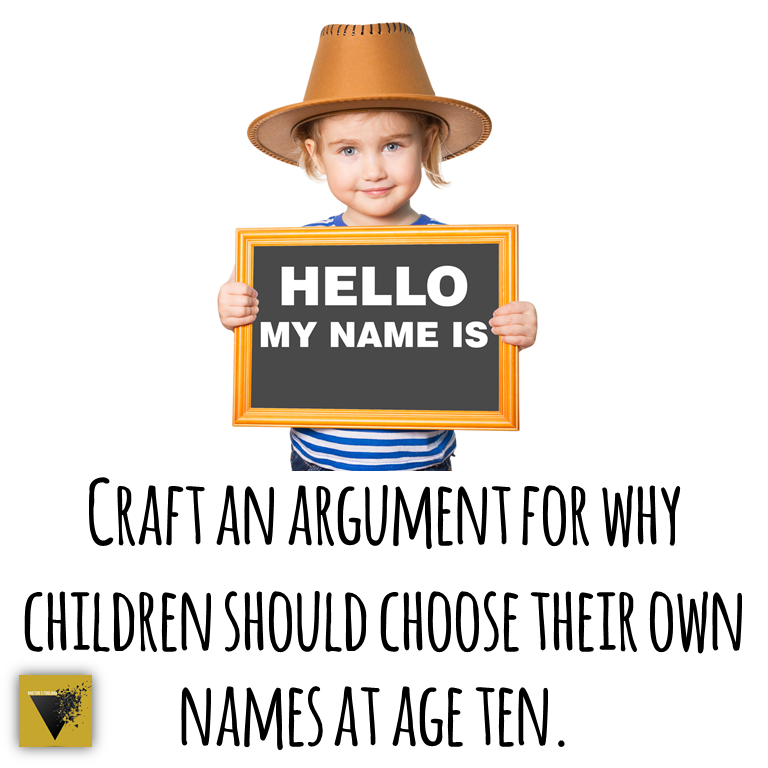 Craft an argument for why children should choose their own names at age ten. Which is worse: having siblings or being an only child? 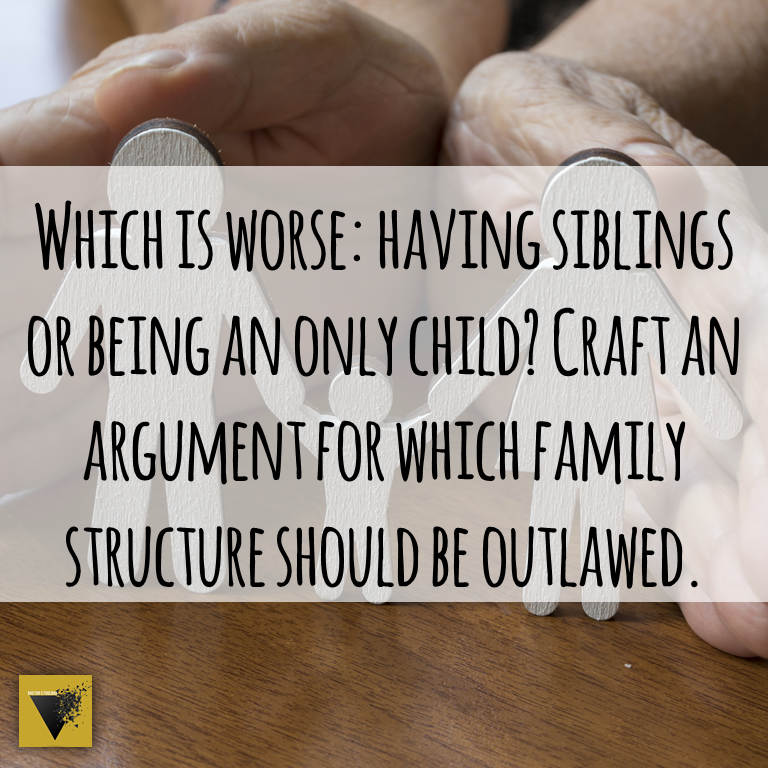 Craft an argument for which family structure should be outlawed. 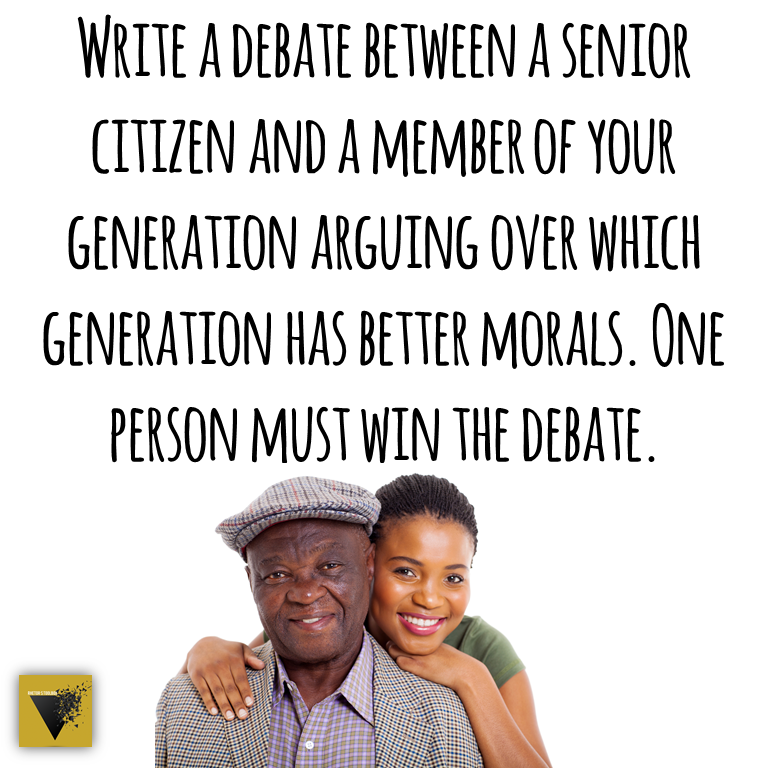 Write a debate between a senior citizen and a member of your generation arguing over which generation has better morals. One person must win the debate. Imagine you are the CEO of a Fortune 500 company. Your customers’ personal information has been hacked, and the media has been running headline stories about it all day. Write the speech you give to persuade your customers to stay with your company. 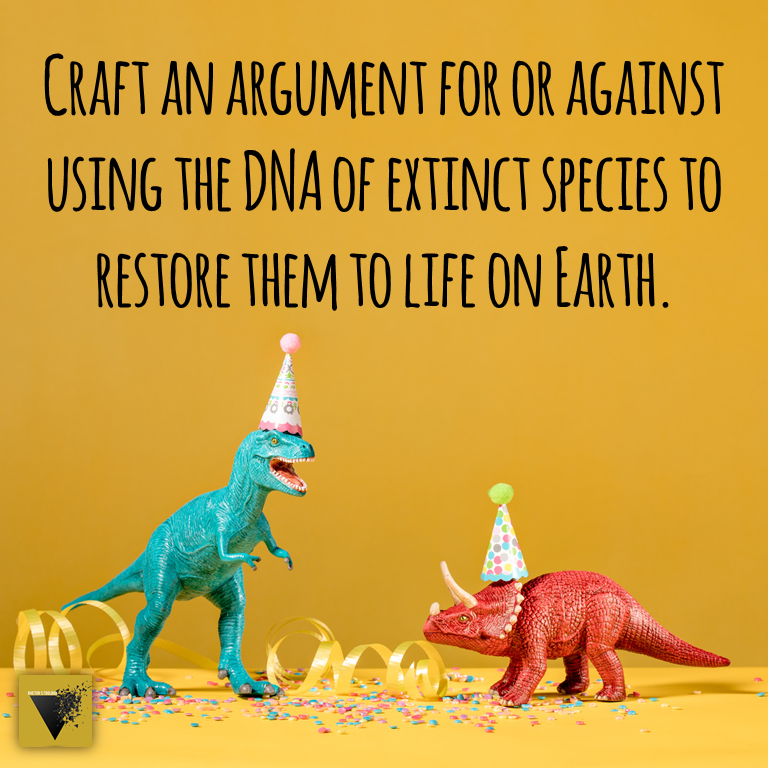 Craft an argument for or against using the DNA of extinct species to restore them to life on Earth. 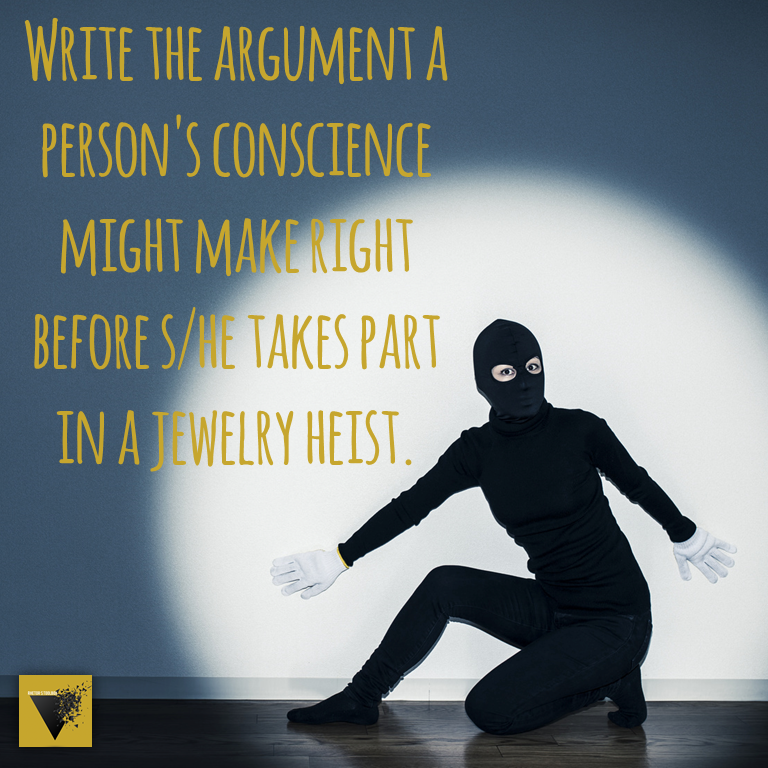 Write the argument a person’s conscience might make right before s/he takes part in a jewelry heist. 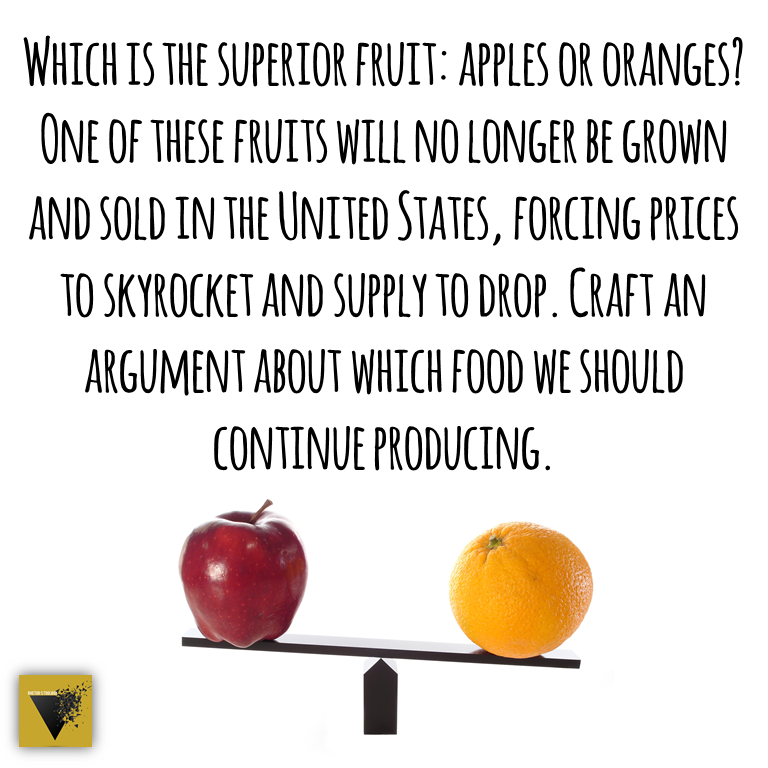 Which is the superior fruit: apples or oranges? One of these fruits will no longer be grown and sold in the United States, forcing prices to skyrocket and supply to drop. Craft an argument about which food we should continue producing. 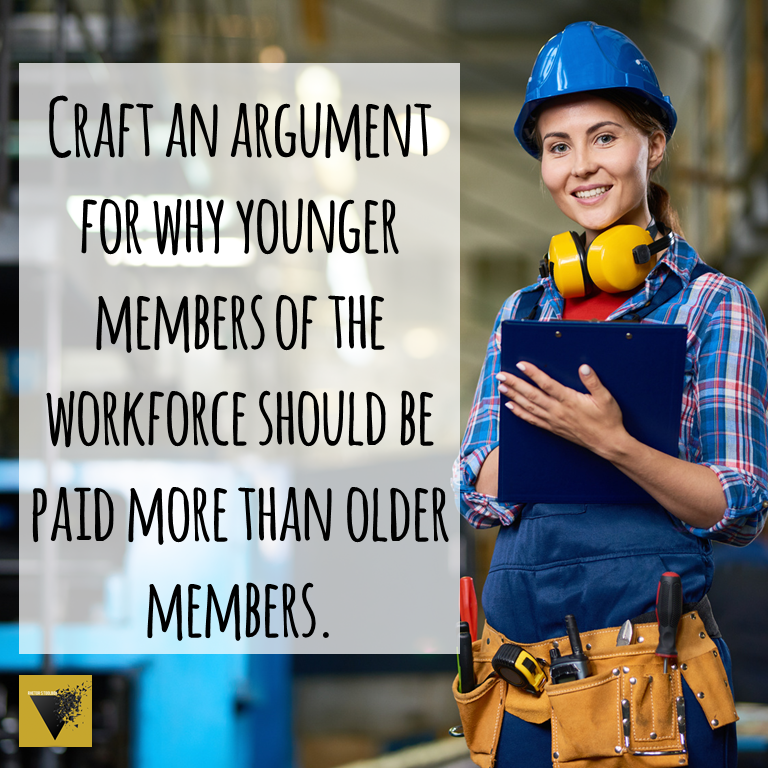 Craft an argument for why younger members of the workforce should be paid more than older members. 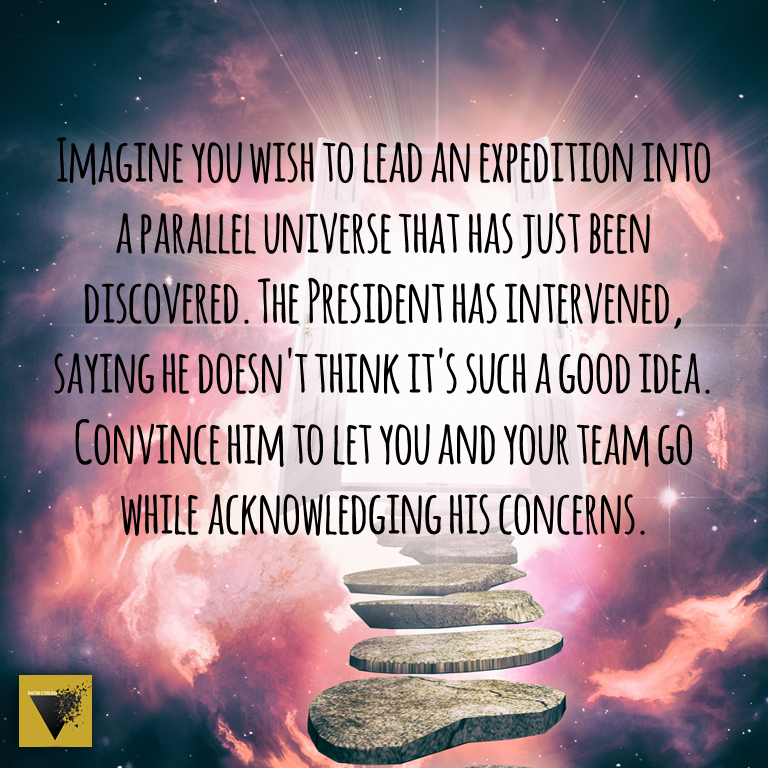 Imagine you wish to lead an expedition into a parallel universe that has just been discovered. The President has intervened, saying he doesn’t think it’s such a good idea. Convince him to let you and your team go, while acknowledging his concerns. 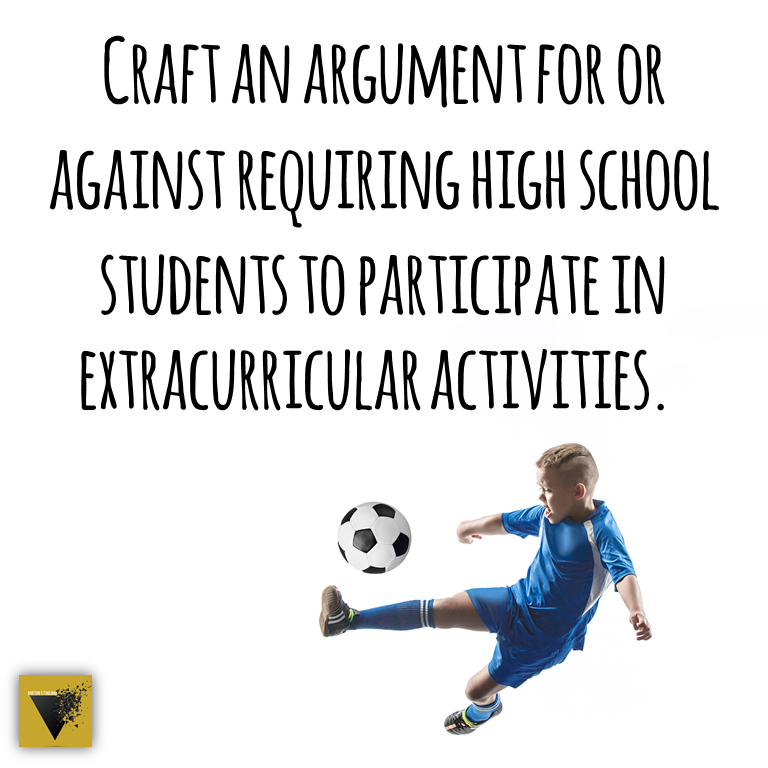 Craft an argument for or against requiring high school students to participate in extracurricular activities. Choose one vehicle to eliminate from the world forever: airplane, bicycle, automobile, or ship. 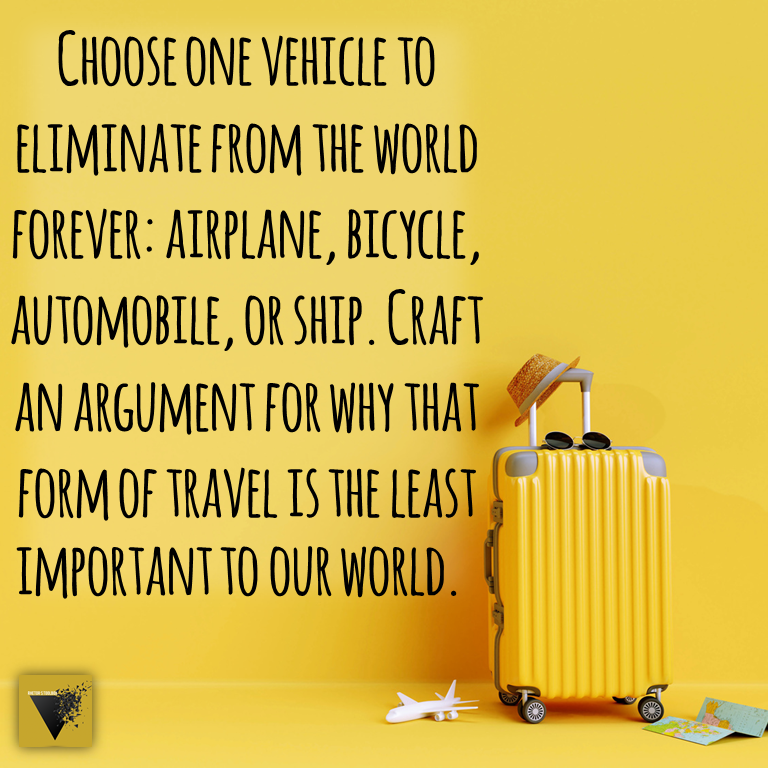 Craft an argument for why that form of travel is the least important to our world. Imagine you are running for President as an up-and-coming candidate from a brand-new political party. 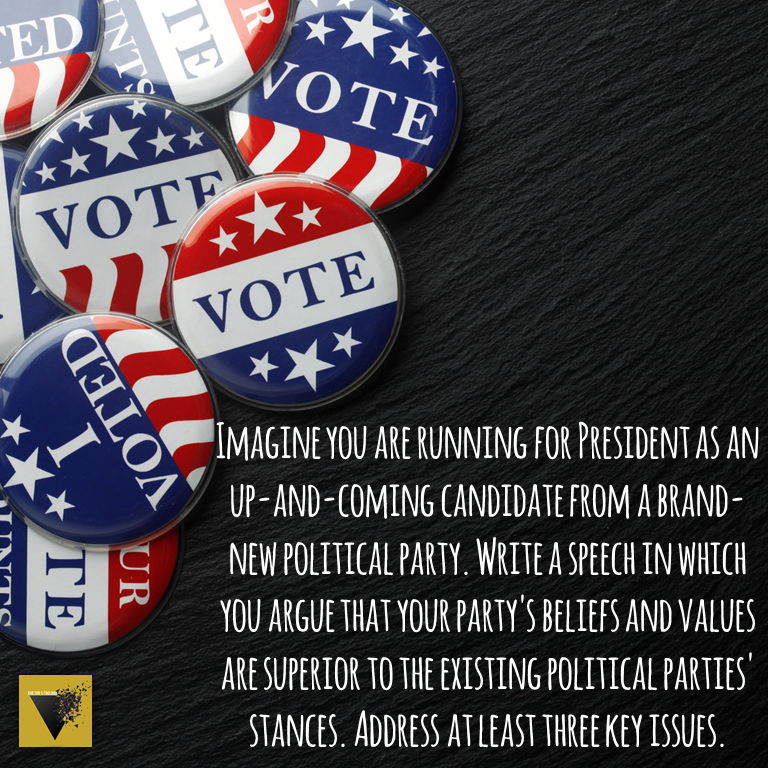 Write a speech in which you argue that your party’s beliefs and values are superior to the existing political parties’ stances. Address at least three key issues. 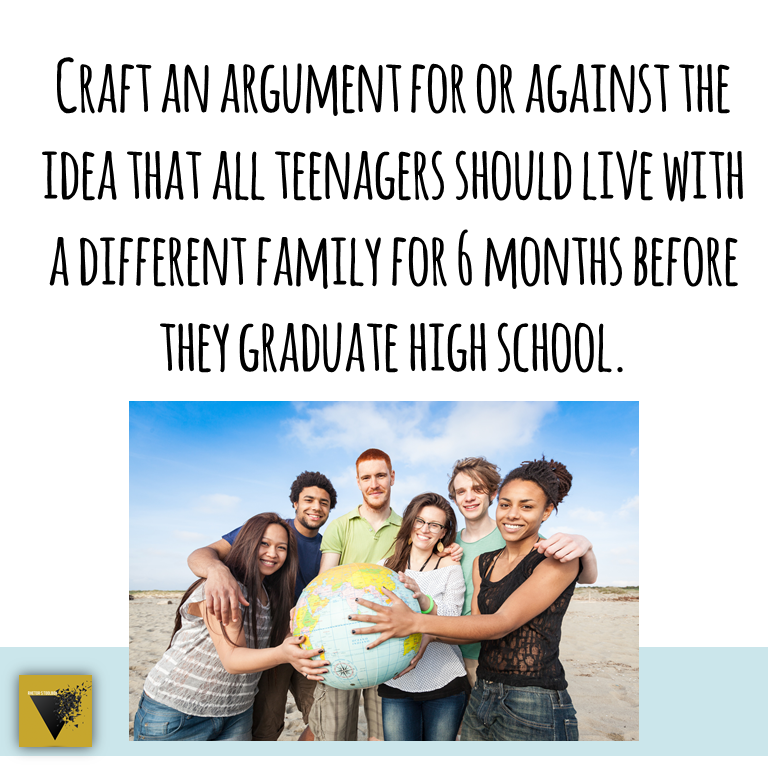 Craft an argument for or against the idea that all teenagers should live with a different family for 6 months before they graduate high school. 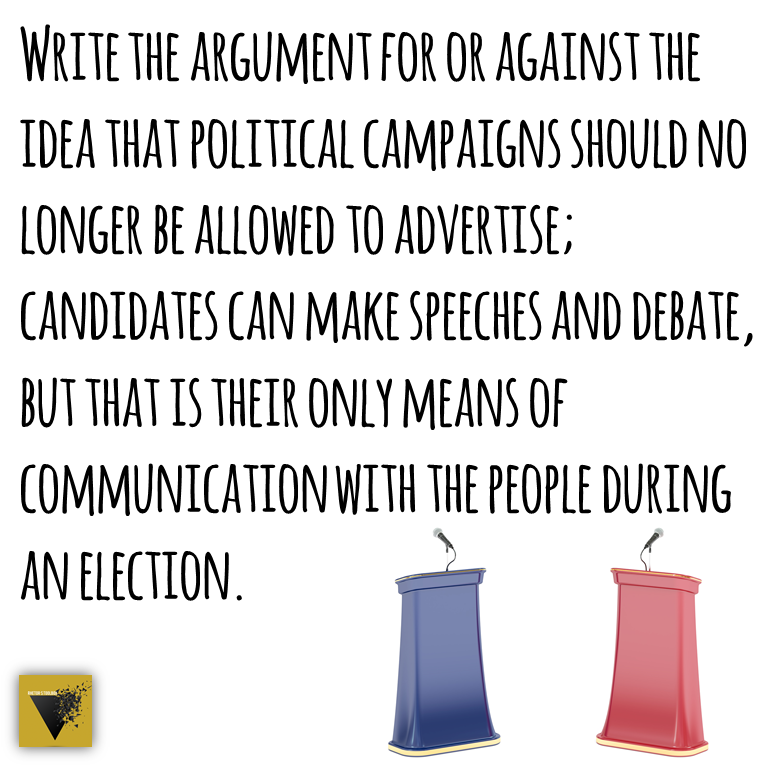 Write the argument for or against the idea that political campaigns should no longer be allowed to advertise; candidates can make speeches and debate, but that is their only means of communication with the people during an election. 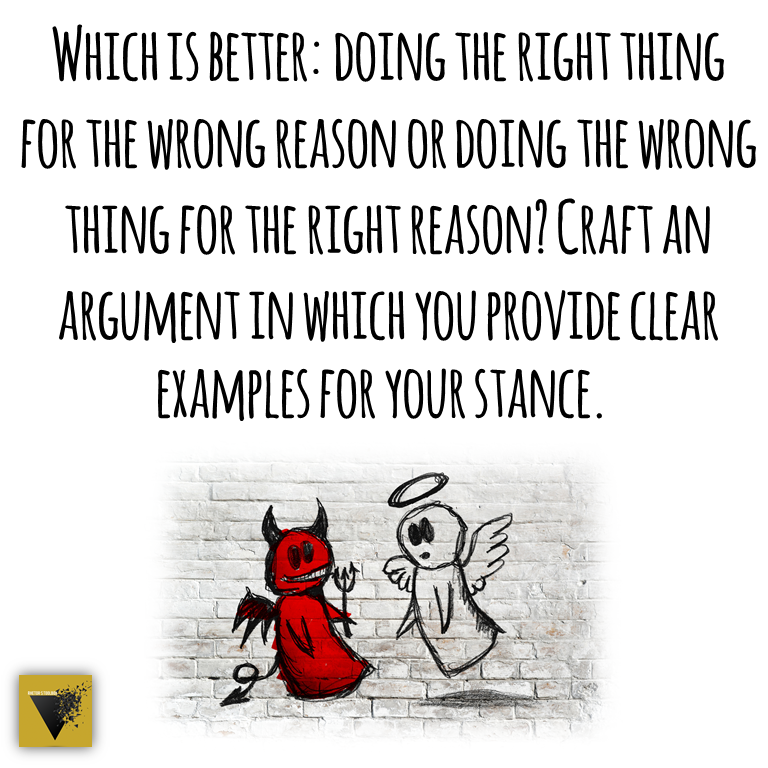 Which is better: doing the right thing for the wrong reason or doing the wrong thing for the right reason? Craft an argument in which you provide clear examples for your stance. 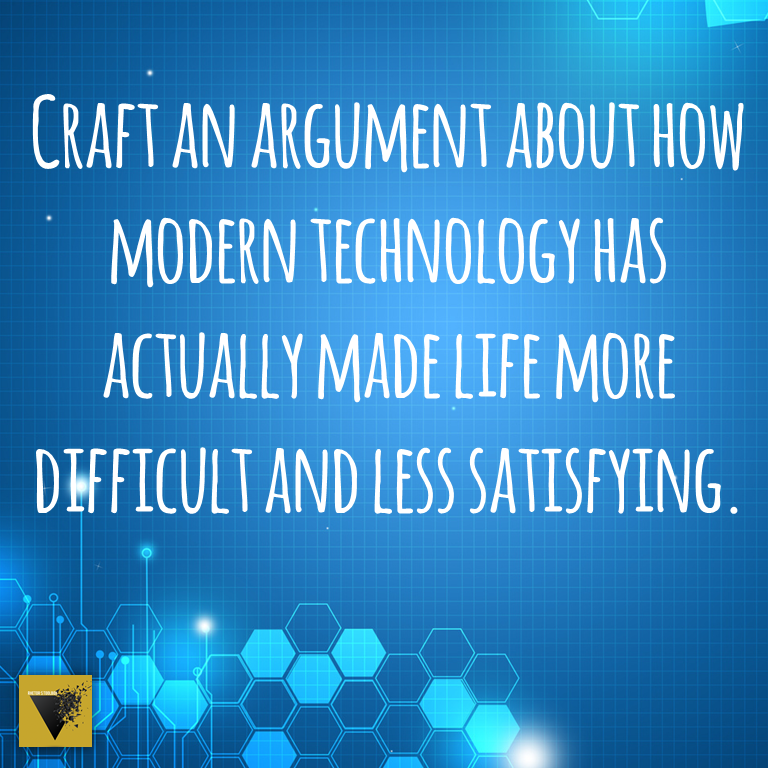 Craft an argument about how modern technology has actually made life more difficult and less satisfying. What a neat post! You’ve come up with fresh and stimulating ideas; just reading through them stirred some real thinking of my own. 1. This post also raised some questions for me, though. When we tell students *what* to argue (e.g. #10, #17, #25), what’s the message they’re getting? Are we communicating that anyone can use rhetoric to argue nearly anything one wants, so we must try to look past the persuasion and consider the argument’s actual merits compared to its alternative? Or are we merely communicating that we can use rhetoric as a powerful tool to get others to agree with our own view, regardless of its merits? I’d like to hear how you’ve addressed this in your own teaching experience. 2. Although rhetorical techniques shouldn’t totally be dismissed, I believe rich knowledge is the crux of good arguments (in the AP Lang sense of the task). What separates strong essays from weaker ones is the presence of clear, precise examples that fit the prompt just right; from there, arguing the connection between the example and the claim comes quite naturally. Low-scoring papers tend to rely on unsupported generalities or examples that are stretched to fit the claim, a sign of students who don’t know enough about the world to respond thoughtfully to claims about it. How can we address such a broad underlying issue? Surely it gets frustrating for low performers – they feel like they keep getting handed random, unrelated prompts they can’t answer in hopes that this repeated struggle will soon make them better equipped to answer the next unrelated prompt. What’s your approach here? You pose some fantastic questions! I’ll give a brief response here, but I think these may be topics for future blog posts. You’ve inspired me. 1. I firmly believe that students should have the skills to argue any concept from any point of view. They need to do this to understand the function of rhetorical techniques. One of the tips students seem to love most is to write against their own viewpoint, especially for the synthesis essay–it makes their counterarguments stronger, but they end up showing a much more nuanced understanding of the concept. Having students argue something other than their actual beliefs can also be a way to help students get out of the “rut” of the 7, when they really need to demonstrate more mature and sophisticated thinking (not just control of the writing) to get to a higher score. Caution is still warranted with touchy subjects, of course, and it’s important that students know they are arguing other viewpoints for the sake of the argument, not for the sake of actually adopting those different viewpoints. How do our values and beliefs shape who we are as individuals and influence our behavior? What is morality and what are the factors that have an impact on the development of our morality? When a person’s individual choices are in direct conflict with his/her society, what are the consequences? How do public and private spheres of existence change our perspective? We also read an “anchor text,” a longer text (usually fiction) that we use to practice analysis skills. For that unit, we read Canterbury Tales and look at the rhetorical differences between a few key characters’ stories. Students can use the texts we read as a starting point for examples, then connect to real-world examples as their essays build. I restructured the class this way a couple of years ago because I felt like my students really needed their classwork to help them create a bank of better examples than what they were coming in with otherwise. Teaching Shakespeare? You Need These Anchor Charts!